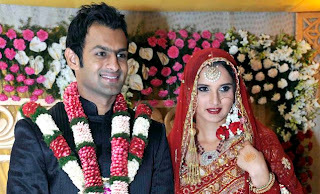 Finally after a long wait Pakistani Cricketer Shoaib Malik and Indian Tennis Star Sania Mirza have reaches the Pakistan. Everyone was waiting for them very excitedly and finally both the Stars reached Karachi Air Port today on 22 April 2010 at 3 PM Pakistan time. There was too much rush to watch them on Karachi Air port which also created problems for Sania and Shoaib but Security controlled the situation. Later on at 7 PM Both of them went to Islamabad from Karachi. They will stay in Islamabad for few days and then will come to Lahore. The Walima will take place on 27th of April in PC Hotel Lahore.